Our designers will work with you to determine if you want to utilize beveled, clear, textured, or colored glass. You can help to create the effect and welcome you want your family, friends, and neighbors to experience when visiting your home by applying one-of-a-kind stained glass art to your entryway. 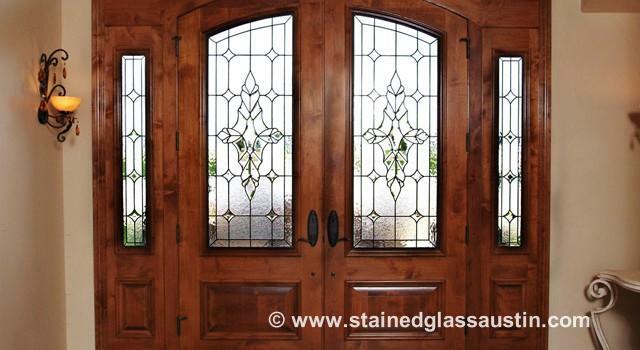 Stained and leaded glass can be applied to any window in any room, but sidelights and doors are one of the most practical scenarios for them because, unfortunately, sidelights and door windows without any sort of covering produces the perfect opportunity for absolutely anybody to walk up and easily peer into your home. At night, with the lights on inside your home, passersby can even view the interior of your home from a distance. This compromises your comfort and even your safety. Blinds and curtains can be applied to your sidelights and doors, but you are trading natural light for privacy with these applications. They can also be overwhelming on a thin window, deteriorating the aesthetics of your home. With stained glass you do not have to jeopardize your natural lighting, ambiance, or décor. Leaded and stained glass is beautiful and custom designed to your individual style. It also has dual functionality because it creates privacy while still allowing sunlight to enter the interior of your home. Protecting your comfort and safety can be easily achieved by utilizing stained glass as a solution. Once you have installed stained glass to your entryway, the resale value of your home immediately increases. If you eventually decide to leave your current home, it is important to consider prospective buyers when presenting your house to the market. When viewing your home for the first time, future homeowners will immediately sense individuality and elegance because of the unique entryway they are confronted with. Something as simple as stained glass will help you to sell your home faster. Though sidelights and doors are very popular places for stained glass to be applied, it can be a tricky process which requires a trained and talented designer. For windows in these locations, it is imperative to consider how it will look from both the inside and outside. Our knowledgeable and experienced team will take both your exterior and interior design into account when creating your stained glass, finding the perfect balance and optimizing all views. Scottish Stained Glass provides free, in-home design consultations where our designers will work with you to create a unique piece of functional art. Call or email us today, and we will gladly answer any questions you may have.